Notre Dame’s alleged human skin book, now proven to be pig. Photo by Megan Rosenbloom posted with permission from Hesburgh Library at Notre Dame. Often when a story associated with a rare book is too good to be true, then it probably isn’t. 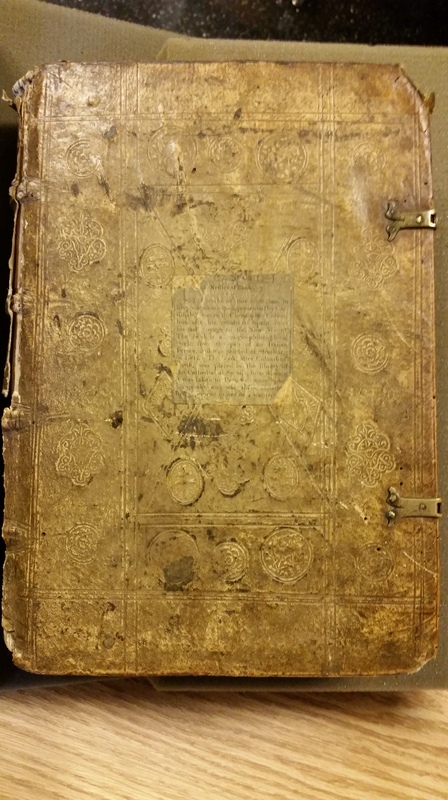 Such was the case with Notre Dame University’s Hesburgh Library‘s alleged example of anthropodermic bibliopegy: a 1504 philosophy book said to be owned by Christopher Columbus and bound in the skin of a “Moorish chieftan” that was stolen from a monastery as a spoil of war. Our scientific team uncovered via Peptide Mass Fingerprinting (PMF) testing of the book’s binding that while it is not human, its pigskin binding is perhaps more at home at this venerable football school. This Notre Dame Magazine article unravels the odd provenance of this book, proving that even when a book is proven to be a fake human skin book, it often still has plenty of interesting tales to tell. In other news, our team’s Megan Rosenbloom is presenting about the team’s work on anthropodermic books at the Archivists and Librarians in the History of the Health Sciences annual meeting in Minneapolis next week, followed by College of Physicians / Mütter Museum librarian Beth Lander speaking about her detective work surrounding the identity of three of the Mütter’s five proven examples of anthropodermic bibliopegy. There’s a lot of exciting behind-the-scenes work and testing going on at The Anthropodermic Book Project, we hope to have more illuminating results to report in the near future. Notre Dame University on a beautiful day in October 2015. Photo by Megan Rosenbloom. Check this space for updates on the project as they develop.